Who Says It Is A “Road” Bike? Let’s Go Ride A Bike! I finally got that old Trek Antelope 830 rebuilt and have ridden it on a couple of commutes! If you read my previous post about the used Trek 830 I picked up from the classifieds, then you know that I got a lot more (or less) than I bargained for. I was looking for a used mountain bike that was still solid enough that I could clean it up a bit and use it for my winter bike commuting. I thought I had found a great deal when I located the Trek for $65, and my buyer’s excitement got the best of me. When I got home that excitement quickly went away as I realized that most of the major drivetrain components were beat up and worn beyond repair. Well, some more $$ later, with a good bit of learning and elbow grease thrown in, and I actually do have a usable commuting bike. I’ve put almost 30 miles on it, and so far I am happy with the results. One of the first things that I like, but that has taken a lot of getting used to, is the more horizontal riding position due to the lower handlebars. Riding this bike is much more like riding a road bike, which is something I was used to in college, but I’m definitely not used to anymore. Although it felt awkward at first, I have come to enjoy the more aggressive feeling that comes from leaning forward while riding. The bike also feels much faster than I expected. I ended up changing out the entire crankset, instead of just the front chainrings, and the replacement set is not quite as big as the ones that were on there. I figured this would slow things down quite a bit, but it actually ends up being a very workable mix of gears, good for both speed and hills. All in all, this has been a good experience, especially now that I am able to enjoy the fruits of my labor. At this point the only thing I’m still considering adding is a set of studded tires to deal with the snow and ice that is part of a Utah winter. I’m not sure about that, but it definitely sounds like it would lead to a more solid ride. I’ll keep you posted. BTW, Thanks to all of you that voted in the poll from my last post that asked the question about wearing headphones while riding. The results were very interesting and surprising! I’ve got some ideas for some more polls, so stay tuned. UPDATE: The Trek 830 has become my main ride, and I’ve put a lot of miles on it. Look here to read about the Trek 830’s snow adventure. I even updated it with clipless pedals, and you can read about that here. Scott the bike looks great! Congrats- great job restoring it. So is your hybrid a back up or is this just a winter fling? LOL… hmmm, this probably qualifies as a winter fling, although I think I’ll keep this one around for some trail rides during the warm months as well. Maybe I’ll look for an upgraded road bike in the spring. My comfort bike is a decent piece of equipment, and I’ll probably keep it around for a good while, even if it becomes a backup ride. This was a great learning experience. For all the money I ended up spending I probably could have almost purchased something new, but the experience I got working with modern bike technology was great. At this point I have no fear of tearing into any part of my bikes if they need fixing. That’s one of the great things about bikes… they are really very simple machines, which makes them pretty easy to work on. You need a few tools, and some basic knowledge, but I think anyone could learn to do it. Hi, Nice 830! I have one that I’m rebuilding into a single speed. Did you find the fork on your bike as an aftermarket one or did your bike come with it? If its an aftermarket one, who’s the manufacturer and the model? I’d like to find one for my bike. Thanks for the compliments. It’s been my main bike since October, and it’s been a great ride. The fork is the one that came with it, and I believe it is a stock Trek fork. I found some pictures of a Trek back in the 90’s with the same fork. It didn’t look like that fork came on the 830 model, so maybe my fork was an upgrade at the time of purchase. This site was a good source of information for me… http://www.vintage-trek.com/. If you need tech specs for some of the old parts then Sheldon Brown’s site was also a huge help… http://www.sheldonbrown.com/. I’d love to see some pics once you get your rebuild done. FWIW – I bought my 830 new in 1991 and it didn’t have a suspension fork. Don’t remember it being an option. It’s a straight tube fork painted the same as the frame. Great looking bike. Nicely done. Did you paint your ride during the rebuild? I just picked up a used 830 and, after reading a few sites like yours, im considering a rebuild. Mine needs paint though. There are several scratches and rust stains from the cables. Can i get original stickers to make it look OEM again? Thanks! I wanted to share a success story for those of you interested in customizing the Trek 830 MTB. A few years back I was surprized to find a 1992 Trek 830 Antelope that had ben left for dead in the hard rubbish collection. I recognized the pedigree, and decided to wheel her home to see what might be done to get road and trail worthy. It didn’t take much! I replaced the lower bracket ($25) a new Kenda dirt tyre for the rear ($45) a couple of cables ($7.00) and a used shifter to match the original that had siezed (free) – in all, it took a lazy afternoon of cleaning and setting up amd this bike quickly became my new favourite! The mechanics at my LBS seemed to appreciate my old-school fettish as both had owned the same bike as teenagers and ridden the hell outta them. This weekend I had them replace the front forks with some 80mm suspension forks and it was easy! The bike geometry is unchanged, and it’s a great improvement off road. Shopping list for conversion; 1 x 80mm Suspension fork with 1 1/8″ Steerer tube – Note : Some bike forums incorrectly suggest it is 1″ so watch out! I fitted an unthreaded steerer so I needed to replace the headstem too. Front V-brake and cable to replace the cantilever type, some new bearings and a spacer. I decided to replace the stock flat bars with a 2″ riser to improve my riding position and we are done for less than $180.00 installed. Under budget and a nice job. So no doubt some people would think spending money on an ‘old’ bike like mine is a waste, but I appreciate this old horse and she deserves to be loved better than that. I bought my Antelope 830 in the late 80’s and I still ride it. It has survived several trips to the beach, mountains, even a house fire and is still rock solid. The elipticle chainrings were very cool at the time and I swear I can still feel the difference in a climb. I purchased a new Marin recently but still love the feel of my old hardtail! Trek Rocks! I just picked up a Trek Antelope 830 yesterday. I believe it’s a 93 as its black with white decals and not flat black. I got it from a local seller and was just in love with it as soon as I saw it! It needed a good cleaning so seller thought it was worse than it was. I got it for $90 which I feel was a good deal. It shifts great and after 30 minutes of detail it looks practically new! The seat has a small tear but I love the originality of it so I’m keeping it! I love that this bike has a small following! Nice to meet fellow owners! Found an Antelope 830 on Craigslist this morning for $100 and to this untrained eye looks stock with lime green and purple paint. I’ll chat around and see if the handle bar height can be raised (this aging body doesn’t like much neck or shoulder strain and at 57 a nice comfy seat would put a smile on). The garage sale and pawn shop bikes I keep giving away lead me to this Trek hoping with a few adjustments will be a keeper. Side note: The biking community has gone ballistic since I was a kid and the sweetest ride was a Schwinn Continental. 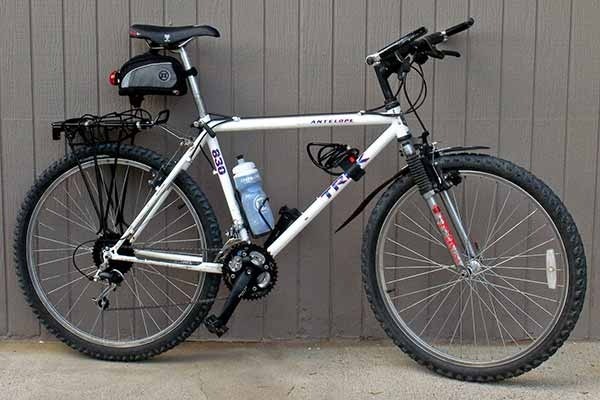 I need to replace the Front Forks on my Trek 830 98′, I’m thinking. Flat gray with yellow front forks. Threads stripped out years ago and have slowly lost any tightening capabilities. Would just as soon replace with original due to the huge amount of modifications and change in specs since then. Will try the links posted above, but any other ideas would be of help. My parents bought this bike for me as a high school graduation present in 92. Same coloring as the bike at the top of this thread. It’s true that the bike did not come with suspension forks. I rode this bike hard for about 5 years and went OTB on a number of occasions. Then, I changed jobs and fell out of contact with the people I rode with and as such, didn’t ride much anymore. Fast forward another 10 years and I dusted the bike off, oiled the chain and hooked a little baby cart on the bake of it, and then a trail a bike, for family bike rides. 24 years later, I just bought some new shifters to replace the original shifters that came on the bike. Only other thing I’ve replaced on the bike (besides tires and tubes) is the saddle which at one point was worn through to the staples (ouch). It’s been a great bike and I’m expecting many more years of service out of it. Anyone who comes across one in a junk pile as “Keep on Trekkin” did above, I recommend digging it out and putting a little love into it.